This post will show you how to make a multivitamin smoothie and give your kids all the nutrients they need. Good nutrition is the best for your family. To me, this is the perfect healthy breakfast idea. Make a multivitamin smoothie for kids every morning and feel good knowing they are starting the day full of nutrition. Fruits, veggies, and supplements that will help them stay strong and healthy. It is so easy! Just blend all the ingredients and you have a glass full of goodness! You can always try different fruit and veggie combinations and add important supplements that will give your kids all the nutrients they need. Choosing a good multivitamin is vital for their optimal development. And the best time to take any supplements is in the morning, on an empty stomach, for better nutrient absorption. Every time I take my kids to the pediatrician I get this reminder. Are you giving your kids a multivitamin? The reason why doctors want you to give your kids a multivitamin is because a lot of kids are picky and won’t eat enough healthy foods like fruits and vegetables. A comprehensive premium multivitamin will provide these children with key nutrients missing from their diets. So, I started looking for the best multivitamin for my kids and found out valuable information I will now share with you. Like the fact that most vitamins are not made from real food sources. Pretty disappointing isn’t it? They also contain lots of preservatives, artificial food colorings, and refined sugars. Uhmm…not really what moms are looking for…. After my extensive research, I found the perfect multivitamin for my kids. 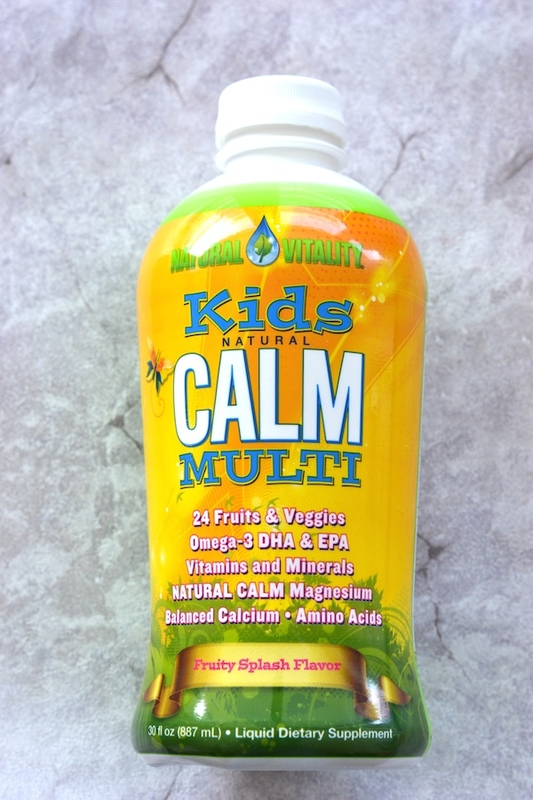 Kids Natural Calm Multi from Natural Vitality. It comes in a liquid form and it is sweetened with stevia. 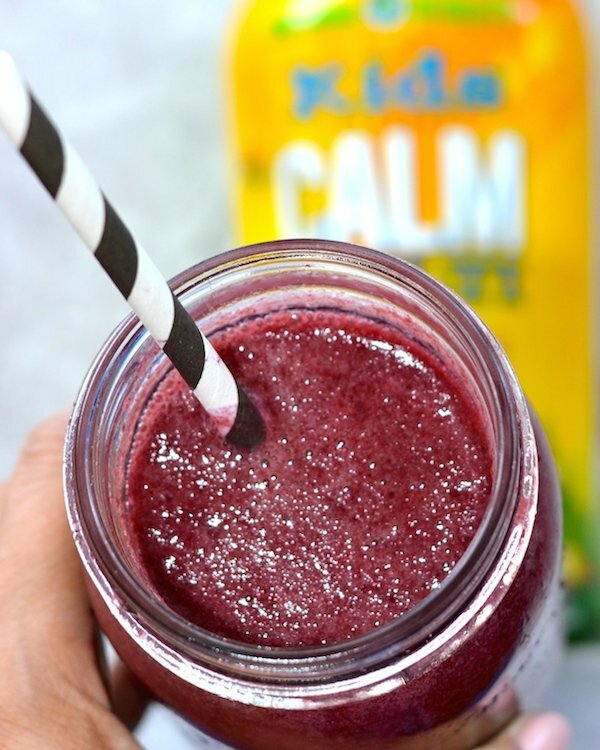 You can add it to any liquid of your choice, but I think it is just perfect to mix it with smoothies. This is why I make a multivitamin smoothie for kids every day! All their ingredients come from natural food sources. This multivitamin contains 24 organic fruits and veggies, and incorporates superfruits (organic pomegranate, acai, goji and noni), and fruits (tart cherry, raspberry, strawberry, cranberry, banana, blueberry and apple), plus vegetables (carrot, pumpkin, pea, spinach, broccoli, tomato and alfalfa). 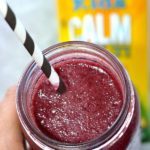 Kids Natural Calm Multi also features omega-3 DHA and EPA, natural calm magnesium, bioavailable calcium and plant sourced amino acids from quinoa. It’s a lovingly-crafted formula designed to provide the best nutrition for our kids. Remember that we absorb nutrients much better when they come in natural forms like real fruits and vegetables and not synthetically created. This multivitamin will also help your kids focus, maintain calm energy, and keep their immune systems strong. It is recommended for for ages 4 through 13. Magnesium is a wonderful mineral that is essential in your kids’ overall health. It also has calming effects and helps regulate the nervous system. Magnesium is one of the most depleted minerals in our soil so the foods of today have much less than in our grandmother’s day. This is why you see a lot of people with magnesium deficiencies. Supplementing with magnesium can help your children feel better, sleep better, and even perform better in school! If you want to learn more about magnesium and its wonderful benefits, please see my Detox Bath For Kids post. 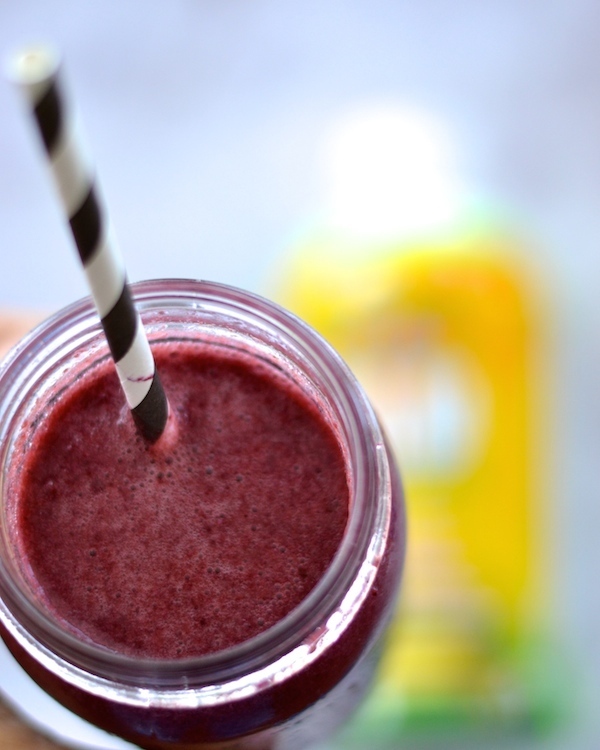 Now, let me show you how to make a multivitamin smoothie with a super easy recipe. The pictures in this post show a blueberry/kale smoothie. 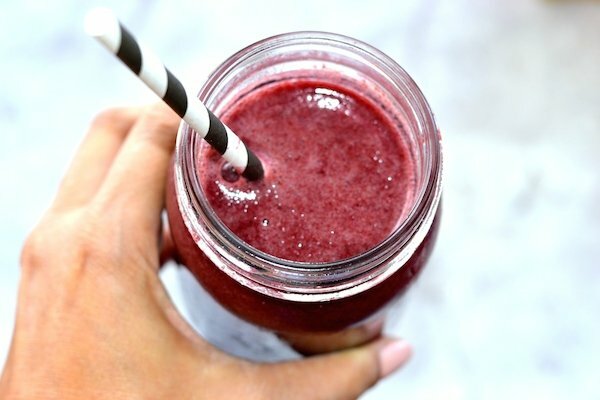 I used frozen blueberries and fresh baby kale to make this delicious smoothie. My kids LOVE it! For more ideas please see my other Smoothie Recipes. If you are interested in other natural remedies and how to keep your kids’ immune system strong, check out my 6 Natural Ways To Protect Your Family From The Flu and 5 Supplements To Make Smoothies A Nutritional Powerhouse posts. Our children deserve the best. I truly believe that good nutrition will translate into excellent health and optimal development. A yummy way to add a premium multivitamin and give kids all the nutrients they need. Best in the morning on an empty stomach for better absorption. If you want to make a smoothie with just fruit, add 1 cup in total (for one serving). You can add the multivitamin afterwards, to each glass, if making more than one serving. I recommend using coconut water or almond milk for best tasting results. Great combinations: blueberry/kale, strawberry/spinach, carrot/orange, mixed berries/beet. 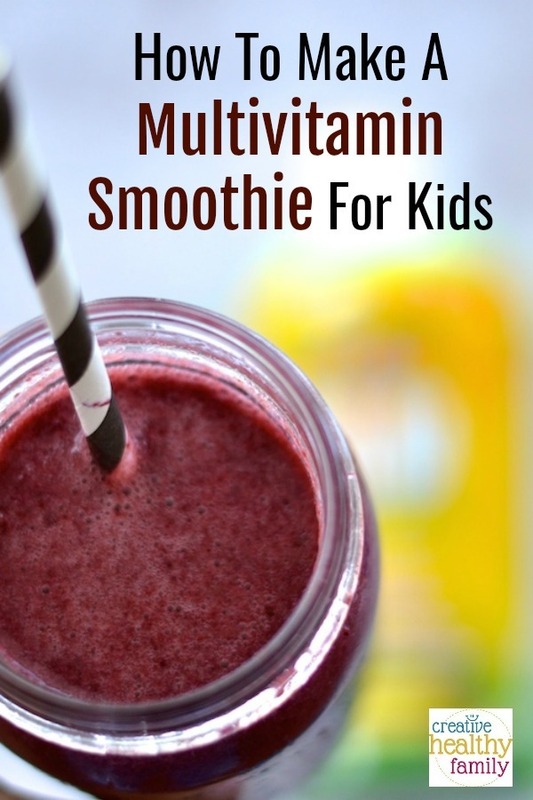 This How To Make A Multivitamin Smoothie For Kids post contains affiliate links. The products linked are the products I use and recommend. If you purchase a product through an affiliate link, your cost will be the same but Creative Healthy Family will automatically receive a small commission. Your support is greatly appreciated.